While the list provided above is impressive, it’s only a sample of the team-building activities you’ll find. 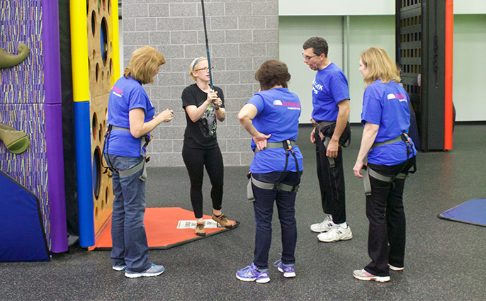 To learn more about our team building activities, contact Spooky Nook Sports now or click here to see some examples. We know it can take a while to build trust and confidence between team members. Luckily, our campus can accommodate your team with ease if you want to schedule several days of team-building activities. As they participate in team-building, your team can refuel at our food court or smoothie bar. You can also schedule group meals at our onsite restaurant Forklift & Palate, where your team will feast on modern American food. You can further enrich the bonds between your team’s members by making arrangements for them to stay overnight at The Warehouse Hotel. With your team staying at the hotel that’s on our campus, they can spend time together instead of driving to and from our location. This extra time that your team spends together can deepen their relationships and increase the confidence they have in each other. No matter how big or small your team is, we have team-building activities near Harrisburg, PA designed to bring your whole team together. From Bubble Ball to field hockey plus volleyball and more, your team will work together to win when you make a reservation for team-building activities at Spooky Nook Sports. To learn more about how our team-building activities can benefit your team, give us a call or stop by our convenient location today. We’ll discuss your goals with you and help you pick the activities that will bring your team together successfully. Contact Spooky Nook Sports for more information now.